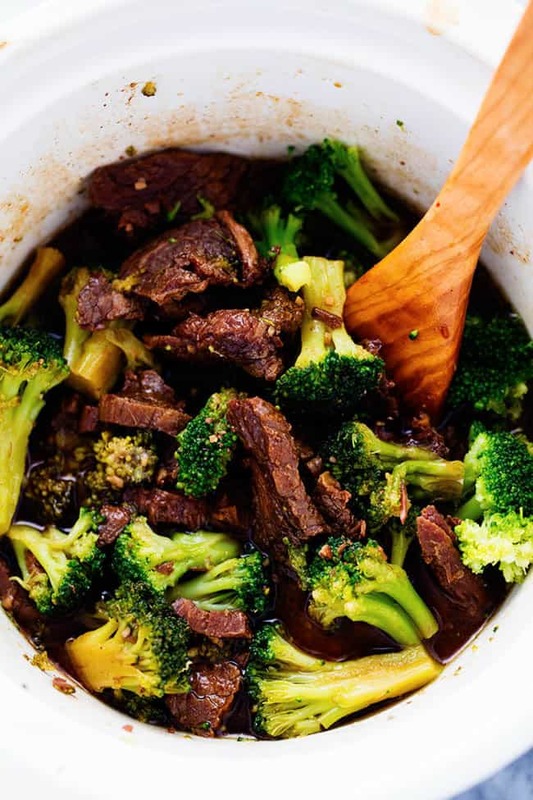 This Beef and Broccoli takes just minutes to throw in the slow cooker. The beef melts in your mouth and the flavor is out of this world! My top five favorite recipes on the blog! I made this recipe back when I first started my blog. It is still in my top five favorite recipes here on the blog. I love beef and broccoli and I always order it whenever we go out. Well this recipe in my opinion is better than takeout and only takes minutes to throw in the slow cooker! This recipe was due for a muchly needed picture update. The first picture I took was just not doing this recipe justice. Luckily people still took my word for how amazing this recipe is and it gets countless rave reviews! Making this recipe again today reminded me of how BOMB it is. Wow. The flavor is incredible. There is something about cooking this meat all day in the slow cooker that makes it so tender and melt in your mouth. It cooks perfectly. And the flavor of the sauce is amazing. Just like you would expect in a restaurant. 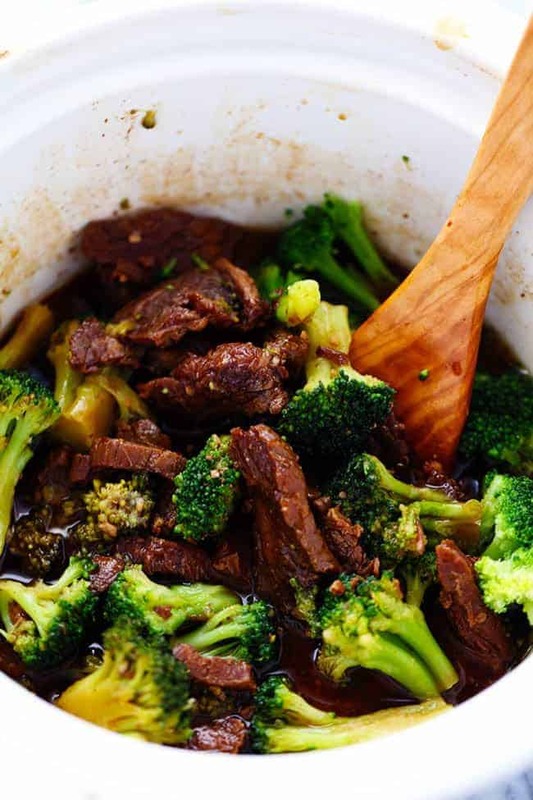 If you make a recipe from my blog and are a fan of beef and broccoli… you have GOT to make this. Like go to the store and buy the ingredients and make it ASAP! It is so good that it will be the biggest hit at the dinner table. You will make it again and again, just like we do! Turn the crockpot on low and cook for about 6 hours. Mine was ready at 5. You don't want to cook the beef too long or it will start to shred. When it is just about done, take 4 Tbsp of the sauce and whisk it in a small bowl with the cornstarch. Slowly stir this into the crockpot. I added the broccoli in at this point so that it could get heated through. You want to let it cook an additional 30 minutes so that the sauce can thicken and frozen broccoli can cook. You don't want to add the broccoli until the very end or it will be mushy. Could you add fresh snow peas and canned water chestnuts? If so, when would you add these? or would you just top it with these? Just found your recipe and would like to make it tonight. What is the recommend time if cooked in high? Hi there! we want to try this but are confused when you say “take 4 Tbsp of the sauce”. What sauce? Thanks! ⅓ cup dark brown sugar, 1 tbsp. sesame oil and 3 garlic cloves minced. Can I brown the strips and then put in crock pot for a few hours? I found a couple of packages of flank steak in my freezer that I need to use. Normally I would make fajitas, but it’s too cold to even think about grilling outside. Do you think I could make this using that meat? 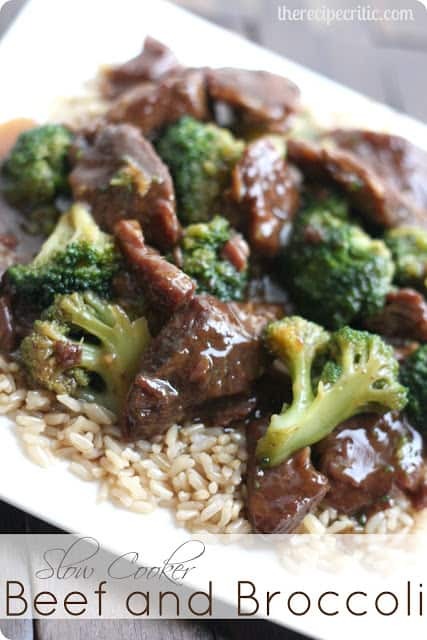 I am making this today and using fresh broccoli, omitting cornstarch. Fingers crossed. I use kuzu to thicken broth rather than cornstarch. I cannot eat any corn products in my diet. Excellent! I used stew meat to save time, and added sliced water chestnuts. Great, easy recipe! What size crock pot did you use? It looks like a small one. Can a pressure cooker be used for this recipe?, if so how much time you think? I tried it with chicken. I kept everything else the same. The family enjoyed it so much! Hi. Is there a way to get nutritional information? Doing Weight Watchers and love beef and broccoli. Thanks. If using fresh broccoli, when would you put it in? You will want to put the broccoli in at the very end or it will be very mushy. This is in my crockpot right now and I can’t wait to try it. I am always on the lookout for something quick and easy so crockpot meals are always my go to. I will let you know how it turns out! Just wondering if the sesame oil is toasted? There is plain sesame oil but if you prefer the toasted sesame oil or have that on-hand you are welcome to use that. It may alter the taste a bit but it will taste just as good! I’m out of beef but I do have chicken breasts. How would I adjust this recipe by substituting the beef for chicken? Do you have a recipe for chicken and broccoli? This looks devine, can’t wait to try it!! Such a great recipe! A new family favorite! We tried this today. It is delicious. Thanks for sharing we love new recipes. Please keep posting them. My crockpot setting choices are 4 and 6 hours on high or 8 and 10 on low. Do you think 6 hours on high is okay? 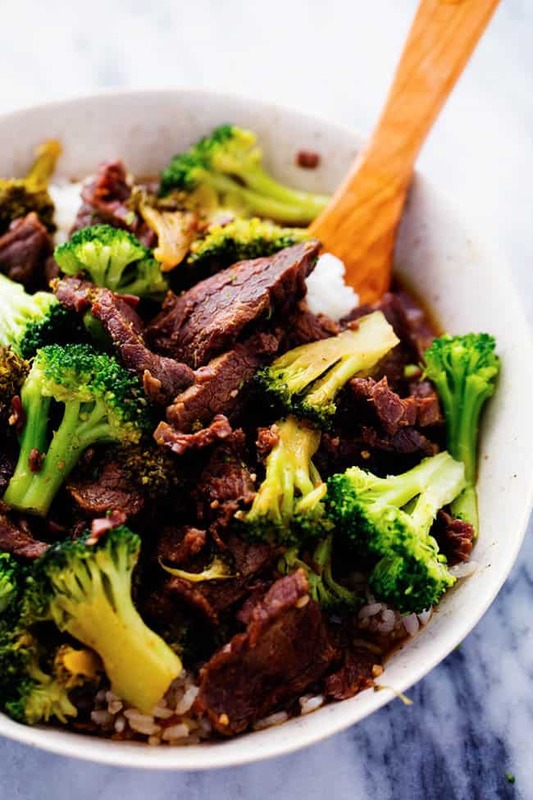 Will I want to stir the broccoli into the beef and sauce once I add it? Hi Alyssa! I would like to use beef tenderloin, do I need to reduce cooking time? I also would like to use fresh broccoli, do I need to cook it more or less time? I would recommend cooking the fresh broccoli a little longer to get it the right softness. The beef tenderloin would need to be reduced in the cooking time but not by much. You will want to check it half way through and see how much time is needed to keep it moist. I only have light brown sugar. Will that still work the same? I just made this and the beef was incredibly tender. I followed the recipe nearly exactly–used a whole 10-ounce can of beef consume instead of just a cup, but otherwise as written–and I found the taste quite salty. (Yes, I used the low-sodium soy sauce!) Maybe I need to use low-sodium beef stock instead? Can I use blackstrap molasses instead of brown sugar? Can I speed up the cooking time by heating the Crockpot on HIGH? Also, I have fresh brocolli. How long does it need to cook and any instructions on when to add the fresh brocolli? I made this in an Atkins/Keto Friendly manner. Instead of dark brown sugar, I used Truvia brown sugar and instead of rice, I added mushrooms and sliced onions. I also used fresh broccoli instead of frozen. 1. In a mixing bowl, whisk together the beef broth, soy sauce, Truvia brown sugar, sesame oil, and garlic. 2. Lay the beef strips in the crockpot and pour the sauce over, tossing the strips to coat. 3. Turn the crockpot on low and cook for about 3 hours. You don’t want to cook the beef too long or it will start to shred. 4. In a skillet, sauté the mushrooms in Sesame Oil for about 8-10 minutes (or until tender). Add the broccoli florets and cook for another 4-5 minutes (add black pepper at this point), then add the sliced onions. Cook until broccoli and onions are crispy-tender. 5. When the beef is just about done, take 4 Tbsp of the sauce and whisk it in a small bowl with the cornstarch. Slowly stir this into the crockpot. Let thicken for about 15 minutes then add the vegetables to the pot and mix well coating the vegetables with the sauce. Yes, that sounds delicious and an added flavor! Making this today, for girlfriend and myself. 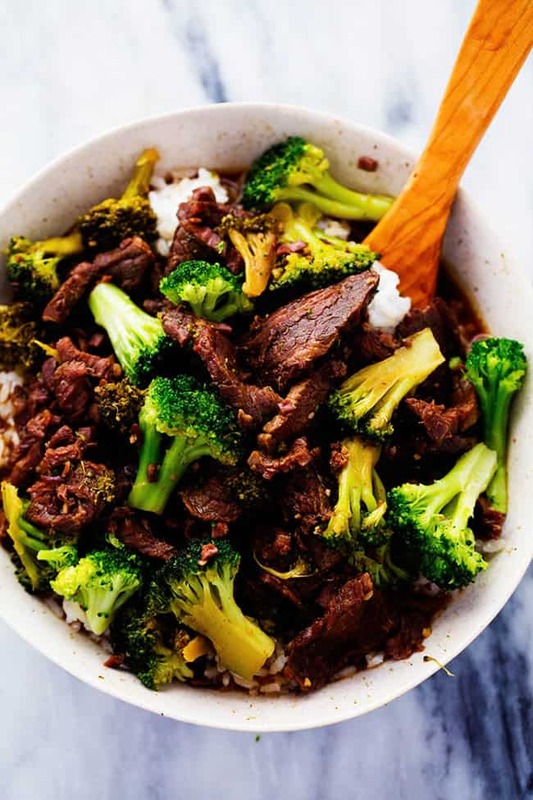 I’ve cooked a few Asian-inspired recipes from an app called FitMenCook before and decided to substite some of the ingredients for what seems to me healthier alternatives. Instead of brown sugar, I’m using coconut palm sugar and instead of cornstarch – arrowroot starch. I did add some crushed red peppers to the sauce with the beef as well. It smells great, and we can’t wait to try it. What’s the calorie count on that dish? What to use to make it spicy?